Teen drivers are at the highest risk for crashes and crash-related fatalities. Teens are particularly vulnerable to distractions while driving. In September 2015, the C.S. 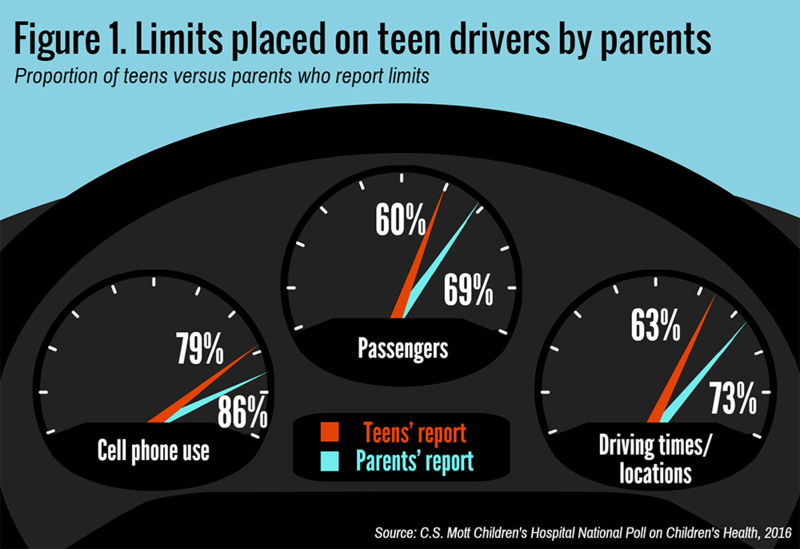 Mott Children’s Hospital National Poll on Children’s Health asked parents of teens 13-18 years old and teens themselves about limits placed on driving circumstances that can increase a teen driver’s risk of a crash. Among parents and teens who both responded, teens consistently say they have fewer limits on their driving than were reported by their parents (Figure 1). Overall, 81% of teens report having at least one driving limit placed on them by their parents. In families where parents report limits on cell phone use, 13% of teens say they have no limits. In families where parents report limits on passengers or driving times/locations, 20% of teens say they have no such limits. Parents who judge their teens’ driving ability as “above average” (32% of all parents) are less likely to place limits on passengers and driving times/locations. Sixty-seven percent of parents set limits on passengers for their “above-average” teen drivers, compared with 81% of parents who perceive their teen drivers as “below average.” Similarly, 69% of parents set limits on driving times/locations for their above-average teen drivers, compared with 85% of parents who perceive their teen as below average. In contrast, parents do not adjust their restrictions on cell phone use in relation to their teens’ driving ability. Teens say their parents have placed fewer limits on their driving than were reported by their parents. 73% of parents restrict their teens from texting while driving. 61% of parents do not allow their teens to drive after 10:00 p.m.
Parents play a key role in promoting the safety of their teens by setting rules and expectations for driving. We found the great majority of parents place some limits on their teen drivers. Limits on cell phone use and texting while driving are most commonly reported by parents and their teens. Fewer limits are set on passengers and driving times/locations. As many as one-quarter of parents report placing no limits on teen passengers or nighttime or highway driving, suggesting opportunities to increase teen driver safety by encouraging parents to place limits on these high-risk driving conditions. Parents reported greater variation in the limits set on passengers and driving times/locations than cell phones in relation to their perception of their teen drivers’ skills. This may reflect parent awareness of, and agreement with, state graduated driver licensing (GDL) procedures, which exist in some form in nearly every state. GDL laws limit cell phone use/texting (at least 38 states), number of teen passengers (46 states), and nighttime driving (at least 48 states) for teens who have limited driving experience. There was greater agreement between parents and teens on limits placed on cell phones than on passengers or driving times/locations. This may indicate that parents communicate to their teens more clearly their expectations around cell phone use while driving than for other driving situations. It is also possible that parents and teens have greater awareness of the risks of using cell phones while driving, due to media attention on cell phone distractions as a common cause of crashes. The higher degree of disagreement between teens and parents in relation to the limits set for passengers and driving times/locations suggests the need for more dialogue in families to ensure rules and expectations around driving are understood. Written parent-teen driving agreements are one way for parents to clearly communicate rules and expectations. Parents set limits on teen driving, but do teens follow? This report presents findings from a nationally representative household survey conducted exclusively by GfK Custom Research, LLC (GfK), for C.S. Mott Children’s Hospital via a method used in many published studies. The survey was administered in September 2015 to a randomly selected, stratified group of parents age 18 and older with at least one child age 13-18 (n=1,517); among a subset of these parents, their teens also responded to teen-focused questions related to driving (n=268). Parents were selected from GfK’s web-enabled KnowledgePanel® that closely resembles the U.S. population. The sample was subsequently weighted to reflect population figures from the Census Bureau. The survey completion rate was 40% among panel members contacted to participate. The margin of error is ± 2 to 6 percentage points. Macy ML, Davis MM, Singer DC, Kauffman AD, Matos-Moreno A, Schultz SL, Clark SJ. More parents could be putting the brakes on their teen drivers. C.S. Mott Children's Hospital National Poll on Children's Health, University of Michigan. Vol 25, Issue 3, January 2016. Available at: http://mottpoll.org/reports-surveys/more-parents-could-be-putting-brakes-their-teen-drivers.